All Black Everything: Fur Coat! 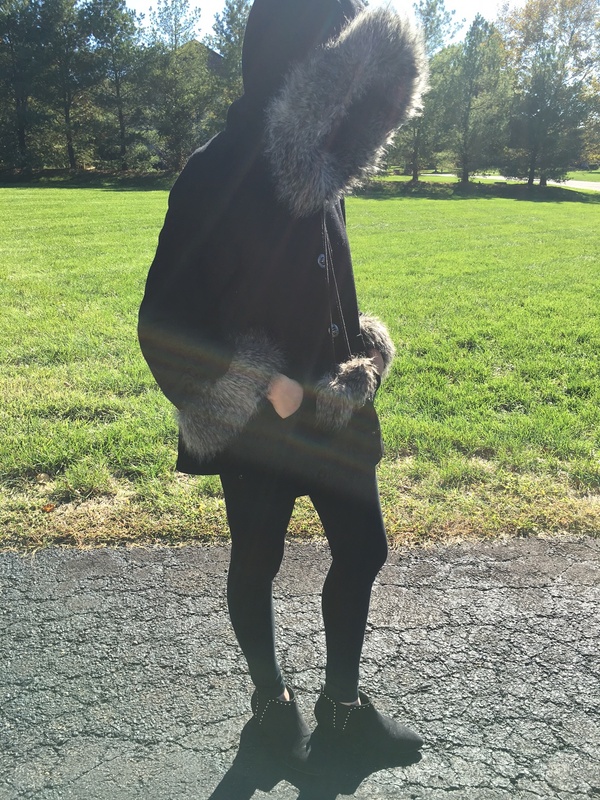 Quick post on my favoriteeeee fur fall coat! This was actually a birthday present, almost 3 years ago now! From one of my bestttt friends! I LOVE it! Every time i wear it, i get millions of compliments on it! It is the most ideal coat for fall weather, especially October – November weather. It’s not warm enough to survive in the winter however, because the inside lining is silk, and the cut/style of the coat is like poncho, so it is wide from the bottom, meaning too much cool air can get inside/under, making me super cold! But it is ideal for fall time, which is when i wear it the most anyways. It has a really nice and deep hood, that when i put it on, i basically disappear behind it, so on super chilly days, that’s perfect! In this look, i paired it with black tights and black long sleeve shirt underneath, super casual–to keep the focus on the jacket. The jacket is from Guess, and it was quite an expensive purchase, so i’m super grateful to my friend for getting me this perfect coat! Now in this picture, you see the sun is blazing, but don’t be fooled, the temperature is quite cold. Since the days/light hours of the day, are getting shorter, it’s getting quite hard to take pictures outside in good lighting, given my schedule and life. So whenever i get a chance i try to do these outfit posts, but winter time will be really hard to share good pictures of my outfits! Don’t forget to share, comment, and follow me along on my instagram to stay up to date on my blog! Also, i’d love to hear from you! Check out how you can contribute to Sprinkle of Surprise by clicking here. Previous Post Birthday Weekend; recap!